There are 3 things I consider to be core to the Dungeoneer experience: Peril, Glory, and Quests. As long as we can maintain these in the RPG in their purest form, then we will have succeeded. Assigning quests in the RPG isn't a matter of dealing out quest cards randomly. Players must earn quests through roleplaying. They must talk to the tavern owner and discover that his daughter is missing in order to trigger the Maiden in Distress quest. Then players will have to follow clues to find out where she was taken to and how to get there. 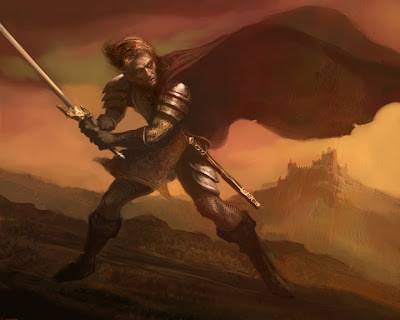 Then they must deal with all the obstacles in the way, and finally with the difficult head-strong maiden herself (or however the Dungeonlord chooses to roleplay her). Maintaining the quest reward system, but expanding it into adventuring party game play was a challenge. If each hero had individual quests and was the only one to benefit upon its completion it is unfair to the whole party, because everyone helps in some manner or other complete each quest. Yet because the typical reward of a quest is "gain 1 level", and if the whole party got that with each quest, the game quickly becomes broken. We wanted to avoid a solution that would complicate the game, or require some complex formula such as "each hero gets 1/4 of a level" or something like that. A formula of sorts was unavoidable, but we needed one that was simple, intuitive, and worked with the spirit of the game. So the QP (quest points) system was born. Each completed quest is worth 1 QP (epic quests are worth 2 QP, and legendary quests are worth 3 QP each). The entire party gets the QP for each completed quest, regardless of who does the finishing move that actually completes the quest. To gain a level requires a number of quest points equal to that level. For example to go from 1st to 2nd level requires 2 QP. To go from 5th level to 6th level requires 6 QP. This ends up feeling very much like an abbreviated XP (Experience Point) system from classic fantasy RPG's. But instead of the XP primarily coming from killing stuff and taking its loot, the reward comes from accomplishing many other meaningful things in the game world. This reward system assumes that each player worked together to get to the place where the quest could be completed. Everyone participates and is rewarded. You are a combat specialist. With weapon in hand you are a terrible force of nature cutting through opponents like a farmer harvesting wheat. You show great vigor, courage, and competence in battle. You are the first line of defense in your party. You can deal out immense damage and absorb wounds that would kill an ordinary man. You protect the weaker members of the party, giving wizards time to cast their spells, afford paladins enough time to call on their gods, and provide cover for the scouts to do their handiwork. While your melee aptitude is second to none, you are inexperienced in the forces of magic and have the least magic ability of all classes. But you more than make up for this lack of mystical knowledge with your powerful sword arm and raging bloodlust. As you gain experience the other party members will learn powerful spells and gain various strange special abilities, but you will only get better at fighting. You will deal more damage, aim more accurately, and hit more foes than anyone else. Melee aptitude: pay any # of Glory, add this # to your next Melee attack. Rapid strike: on a Melee hit you inflict 2 wounds, and hit in the case of a tie. War cry: you and your allies gain +2 Melee for the duration of this encounter. This ability may be used once per encounter and uses 1 Melee attack. Stronghold: you establish a stronghold to begin ruling your kingdom from, gathering peasants and warriors to your banner. Hope this provides some idea of what a character class write up will look like in the Dungeoneer RPG. Wonder if anyone can guess what the mysterious acronyms QP is? I know it must seem like I've abandoned this project, but I assure you it is still in development. There have been some major impediments I'll write about some day. 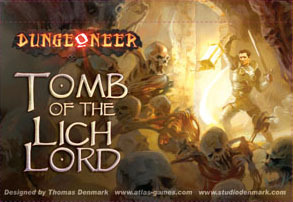 Atlas Games has reported that they've reprinted Tomb of the Lich Lord and it will be in stores soon. This item has been unavailable for some time now and I'm glad to see it back in stock because it is as close to a "base set" as Dungeoneer has. Though all Dungeoneer sets can be played alone or combined with other sets. I don't think any changes have been made to the cards, but it is likely to have the latest rules in it (v2.3).